In U.S. politics, the crowded Republican presidential field is beginning to clarify, following a test vote in Iowa on Saturday and the addition of Texas Governor Rick Perry to the race. Political experts say the Republican race for the moment features three contenders who stand above the rest of the crowded field-former Massachusetts governor Mitt Romney, Texas Governor Rick Perry and Minnesota Congresswoman Michele Bachmann. Bachmann got a boost with her victory in the Iowa Republican straw poll, a test vote for the contenders that could serve as a preview for Iowa’s important presidential caucus vote early next year. “Obama is my strategy. I intend to be the nominee of the Republican Party and to take him on and defeat him in 2012,” she said. 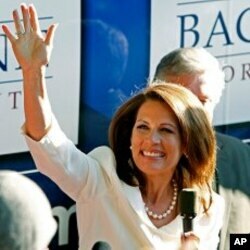 But Bachmann’s victory was overshadowed somewhat by the entrance into the race of Texas Governor Rick Perry. Like Bachmann, Perry appeals to both social conservatives and Tea Party activists who want to reduce the size of the federal government. Perry also hopes to win support from economic conservatives who have favored the frontrunner for the Republican nomination, former Massachusetts governor Mitt Romney. 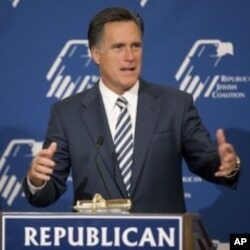 Romney has been concentrating his fire on President Barack Obama. Experts say Perry’s decision to enter the race has shaken up the fight for the nomination. Matthew Dowd, an ABC News political analyst who worked for former-President George W. Bush, predicts Rick Perry will be a formidable candidate. “This guy is an incredible campaigner and for me, having watched George Bush and having worked for George Bush and having known Rick Perry, he is actually a better campaigner at this point than George Bush was,” he said. Romney has a narrow lead among the Republican contenders in public-opinion polls, but many conservatives are skeptical of his record as governor of Democratic-leaning Massachusetts and are looking for a more conservative alternative. Perry is popular with conservatives, but some Republicans wonder if he can appeal to the type of moderate voters so often needed to win presidential elections. Perry will be tested in the weeks ahead, since three Republican presidential debates are scheduled in September alone.